News and commentary about the electronic hobbies of Amateur "ham" radio, Short Wave Listening, CB radio and electronic building and experimenting. The resistance between two ground rods spaced farther apart than their length can be measured to obtain a general indication of their likely ability to safely conduct lightning induced currents to earth. However, resistance measurements taken soon after ground rod installation are inaccurate, because the soil is not yet in good contact with the rods. It is necessary to wait six to eight weeks in average soil to obtain a reliable measurement. The measured resistance will be twice the earth contact resistance of one rod if the rods are identical. Earth contact resistance below 5 ohms is excellent. 5 to 10 ohms is good. 10 to 15 ohms is poor. Grounds with more than 15 ohms resistance are of little value in reducing damage from lightning induced currents. ©2004 Martek International All rights reserved. The AMSAT News Service (ANS) reports Patrick Stoddard WD9EWK has been working the new AO-73 satellite from his back yard. Most of the time, he has been using his normal portable all-mode satellite station – two Yaesu FT-817NDs, Elk handheld 2m/70cm log periodic antenna. One of the AO-73 videos contains audio from two passes, and is about twice as long as the others which have audio from a single pass. Radio is a part of the electromagnetic spectrum - minute variations in electricity and magnetism that, like ripples on a pool, spread out in waves at the speed of light to give us light itself, x-rays and other rays, and radio. Suggested theoretically by James Clerk Maxwell in 1873, identified by Heinrich Hertz in 1887 and given practical value by Guglielmo Marconi in 1895, the radio part of the electromagnetic spectrum ranges from a frequency of about three thousand cycles per second to thirty billion cycles per second. Marconi's early experiments were in the lower frequencies. 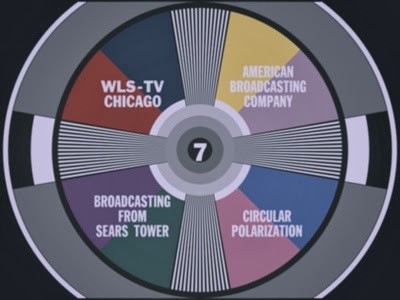 Today every part of the spectrum is used nationally and internationally in applications including terrestrial and satellite television and sound broadcasting, mobile telephones, radar, amateur and Citizens' Band radio, satellite navigation, air traffic control, radio-astronomy... the list is endless. Give radio its old and more descriptive name - wireless - and consider that in most communication where wire (or optical cables these days) is not involved, wireless is. The instant news report from around the world, the cockpit pictures from the Grand Prix car, the next-generation refrigerator telling the cooker the temperature for the casserole - they all rely on wireless technology. There is a mix of magnetic and electric induction fields and an electromagnetic radiation field at distances that are small compared to the size of a transmitting antenna or a wavelength. 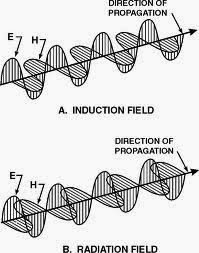 The two induction fields differ in phase and are stronger in magnitude than the radiation field near a transmitting antenna. The magnetic field strength from a doublet is inversely proportional to square of the distance. The electric field strength from a doublet has two components. One diminishes inversely proportional to the square of the distance. The other diminishes inversely proportional to the cube of the distance. However, the radiation field strength diminishes inversely proportional to the distance, so both induction fields diminish faster than the radiation field with distance. Although Nipper, the RCA dog, spent time in the kennel during the abstract-logo years of the sixties and seventies, a change in company management brought him back in time for his one-hundredth birthday in 1984. A lowly mutt in Bristol, England, the original Nipper was adopted by Francis Barraud, a landscape painter, and delighted his new master by his intent listening to an early phonograph. 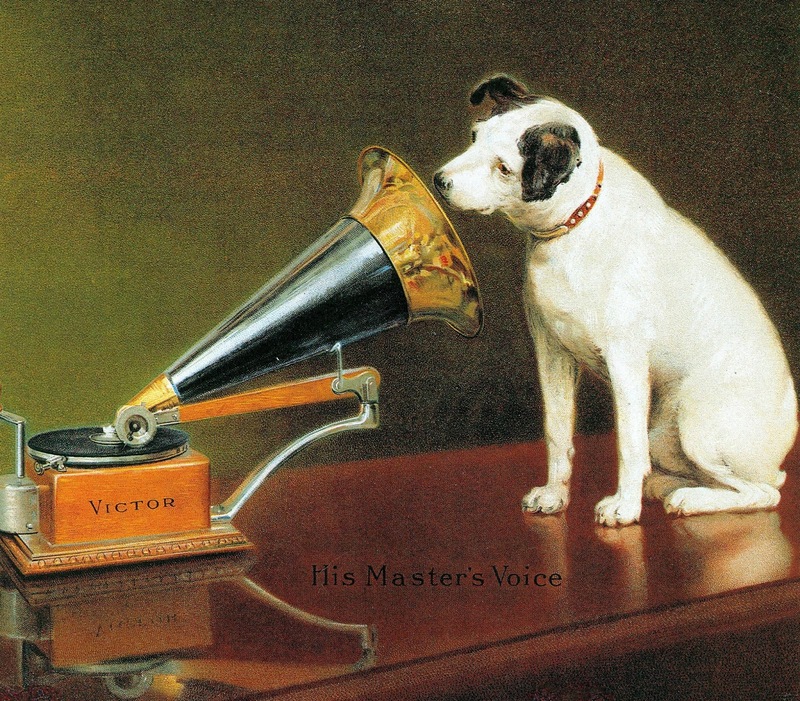 Sometime in the 1890's Barraud made a painting of Nipper and the phonograph titled "His Master's Voice" and sold it to the Gramophone Company in England. Nipper came to the United States in 1901 as the trademark of the Victor Talking Machine Company and moved on to the Radio Corporation of America (RCA) when it bought Victor. Although Nipper died in 1895, he has lived on as one of the best loved commercial symbols in the world. My father, Abraham, died in January 2009. None of you knew him. But you should have, you would have liked him. You would have admired his abilities, his tenacity, and his sense of humor. He was born in Chicago, IL in 1932 to an immigrant family who left Italy in 1911 for a better life. His parents had a total of 12 children, 6 of whom survived to adulthood. The others died either at birth or within a few weeks. It was a hard life on the streets of Little Italy in Chicago. It was a world where the good, the bad, and the discriminated against were all tossed into the same places around Chicago. They had to be tough- and fend for themselves. WU8WV. Awesome Inc. theme. Powered by Blogger.